You know how when you read a novel, sometimes you feel envious of the characters? For example, you get the travel bug after reading something set in a glamorous location, or you get the wants for a fabulous new pair of shoes when the heroine of the book you are reading shops like a character in a book? Or if the characters are enjoying a hot new romance and your husband is snoring like an asthmatic camel? My personal demons are characters in novels who bake sweets. I do far too much sympathy baking and eating while reading this kind of books. 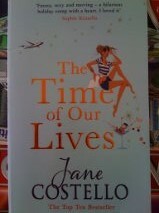 However, I didn’t feel envious while reading The Time of Our Lives by Jane Costello, although I should have. The three main characters in this novel are young enough to be fun but not so young that they bored me. They have interesting jobs and interesting lives. They go away together on a holiday to Spain and have an absolute ball, despite loads of mishaps. By rights, I should have been crying “What about me?” but I wasn’t. I laughed and cried with the characters and felt as if I got to experience all of their adventures too. Imogen is the main character of this novel. She has a great job with a major company, supportive parents and is the single mother of a four year old girl, Florence. When Imogen’s friend Meredith, who is heavily pregnant, wins a holiday to Barcelona’s most exciting new hotel, Meredith, Imogen and their friend Nicola head off for a last blast holiday before the baby is born. Poor Imogen is taken advantage of by everyone (the old ‘ask someone who is busy because they are obviously capable’ thing). While Imogen is on holiday, her mother, who is looking after Florence, constantly phones or Skypes Imogen with every little thing. Imogen’s co-workers and boss are even worse. Her boss gets caught out doing something he shouldn’t have and Imogen gets stuck with the media, trying to manage damage control for the company from Barcelona. Not only that, but she is seated with demon children on her first ever business class flight, gets robbed, meets her old geography teacher on a nudist beach (Ewww) and breaks her arm while on holiday. (Maybe all of these horrible events explain why I didn’t get character-envy with this book). But, there are loads of good things too. Imogen’s friends are wonderful. They take her out shopping and ramp up her look, which has become dull and frumpy since she became a single mother. There are loads of trips to the beach, the pool, crashing parties they haven’t been invited to and getting smashed and dancing. To cap off all of the fun, Imogen meets a great guy in Spain who is clearly very interested in her. The Time of Our Lives is a fun holiday romance with far more depth than I expected. There wasn’t anything particularly ground breaking in the plot, but that didn’t matter. The formula was well done. I had loads of laugh out loud moments while reading but I also shed a few tears. The Time of Our Lives left me feeling as if I had just been on a holiday with friends and had a great time too.